Have you noticed? We are finally heading into autumn. It is, then, high time for a crop of new kicks that will keep you both warm and stylish during the chilly months of the year. 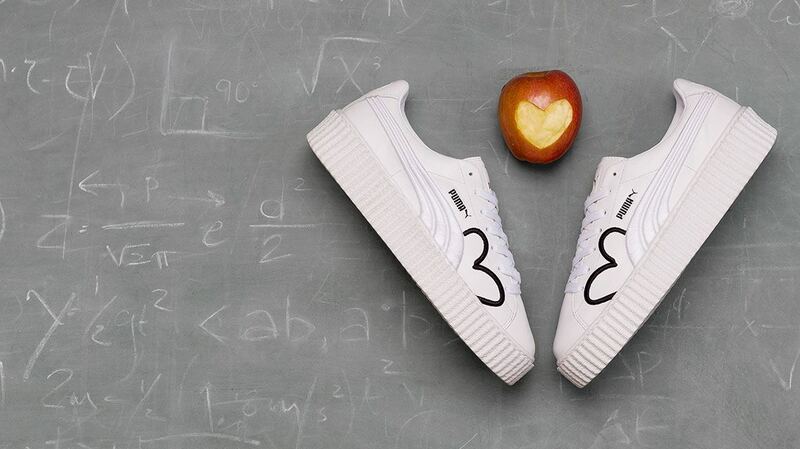 Good thing: PUMA is here with a series of releases with the potential to become your new favorite pieces! Our latest styles include the PUMA X SOLEBOX ‘CHAMPAGNE PACK’, a special release for which we have teamed up with Berlin-based streetwear and sneaker experts Solebox. With the PUMA SUEDE NATURAL WARMTH PACK, we bring you a remastered iteration of a timeless PUMA classic. There is also special focus on a country that has long been one of the cornerstones of the fashion industry: Japan! With the all-new KIKU PACK, the TSUKIMI PACK and the progressive winter sneaker TSUGI KORI, we bow our heads to Japanese street fashion, giving credit to its many unique and cutting-edge trends. 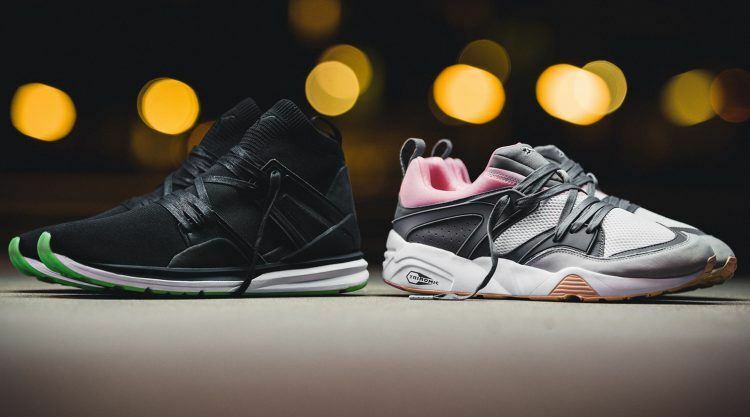 Let the corks pop, Ladies and Gentlemen, for there is a reason to celebrate: PUMA has teamed up with Berlin’s leading destination for contemporary fashion and streetwear Solebox to bring you a special-edition sneaker pack. 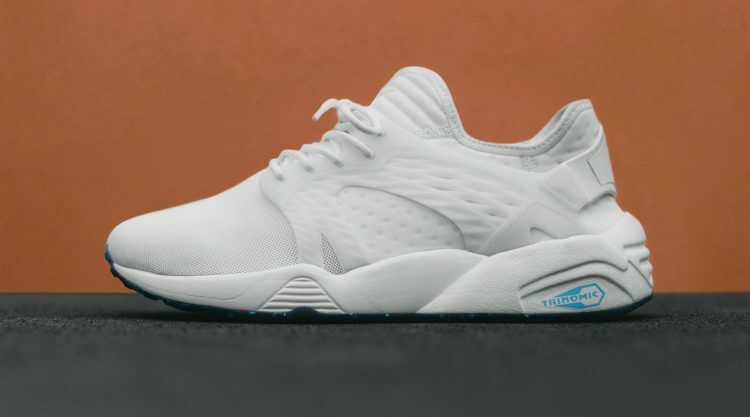 Aptly named ‘CHAMPAGNE’, the pack is inspired by the labelling of luxurious champagne bottles and consists of the iconic nineties-inspired runner, the PUMA BLAZE OF GLORY and its progressive alter-ego the BLAZE OF GLORY LIMITLESS. The celebratory pack drops just in time for the opening of Solebox’s new store in Munich – which is, fittingly, located in a historic wine cellar! The BLAZE OF GLORY included in the pack is decked in a premium nubuck and mesh upper combo with a bold Trinomic sole with hints of Rosé Pink on the outsole. The BLAZE OF GLORY LIMITLESS features a fully-functional sock as well as a glow-in-the-dark outsole in Grape Green to go with its embossed leather and nubuck overlays. Each pair comes with a cork footbed, a Solebox leather heel tab and waxed cotton laces. With this in mind, cheers to impeccable fashion sense! The PUMA SUEDE is undoubtedly among the best-known and most popular of all PUMA shoes. Having been a faithful companion to sports icons across generations as well as pioneers from hip-hop and other cultural movements, the SUEDE delivers a smooth, streetwise swagger and sport-inspired style until the present day. Don’t want to go without your favorite sneakers even during chilly days? No need to worry, we have just given the SUEDE an autumnal upgrade! 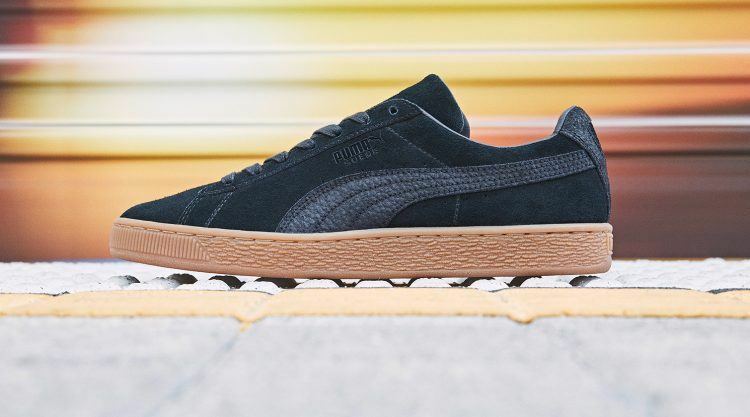 The PUMA SUEDE NATURAL WARMTH PACK features a sleek, water-resistant, monochromatic suede upper and a gum rubber outsole, ensuring comfy vibes even when it is cold and wet outside. The shoe comes in Black or Birch, either version with tone-on-tone laces. 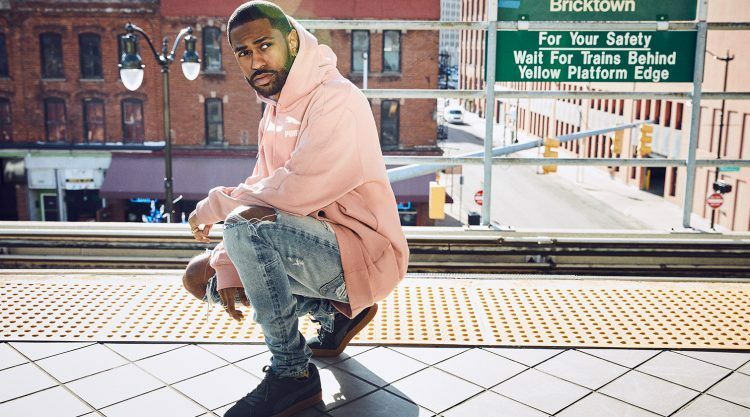 By the way, PUMA SUEDE NATURAL WARMTH enthusiasts are in good company: Grammy Award winning rapper and self-proclaimed sneaker addict Big Sean is among the many SUEDE fans in general and its latest interpretation in particular! Flower symbolism plays an important role in Japanese art, literature and everyday life. The chrysanthemum, called ‘Kiku’ in Japanese, is probably one of the most popular motifs in the country’s culture. Although this beautiful flower only blooms in the fall, the Kiku symbolizes longevity, rejuvenation and integrity throughout the year. 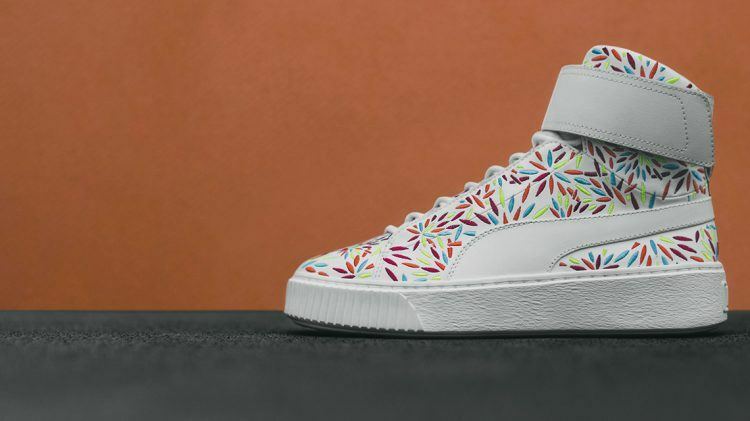 This fall, PUMA celebrates the Japanese seasonal flower of September with the launch of the all-new KIKU PACK, featuring new versions of the CLYDE FASHION, BLAZE CAGE, and PLATFORM MID. All KIKU sneakers are executed in soft leather with embroidered chrysanthemum detailing. The CLYDE FASHION KIKU – originally created in 1973 and named after Basketball icon Walt ‘Clyde’ Frazier – is a slip-on with elastic, hidden lacing. 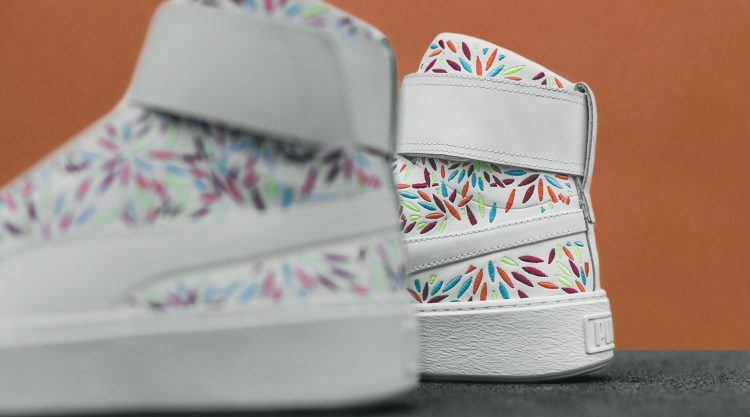 The Kiku reference comes with the all-over flower embroidery detailing on the white upper. 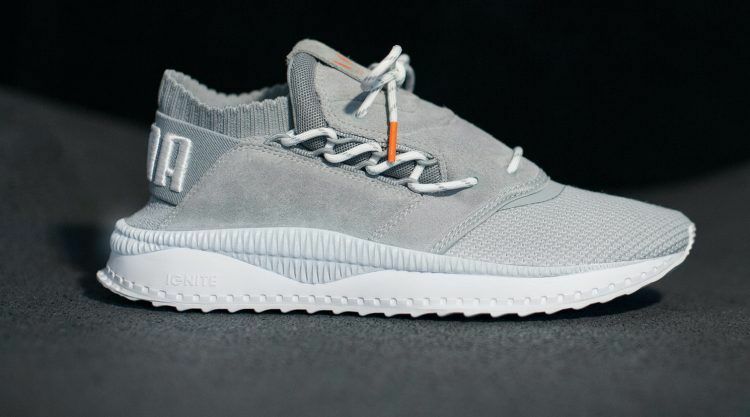 The PUMA Formstripe is a stitch and turn feature to give the style an even more clean and sleek look. Come and celebrate with us, Japan-style! 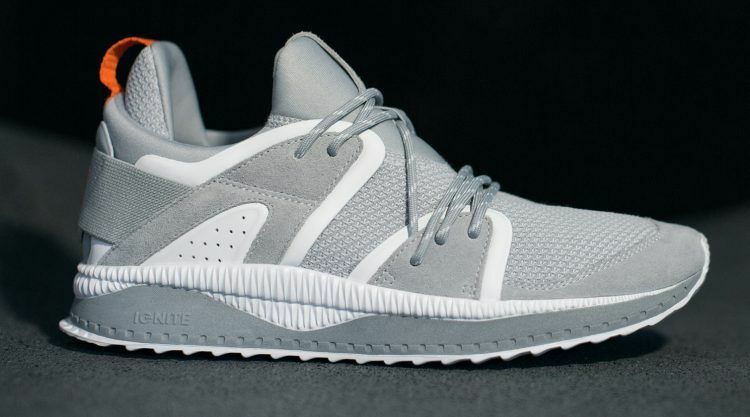 The BLAZE CAGE KIKU draws inspiration from the iconic BLAZE OF GLORY, keeping its classical nineties-inspired running look with PUMA’s trademark Trinomic technology and material play of plush and plastic. The style features a clean, all-over white upper outsole, elevated with a subtle, ice-speckled outsole and graphic chrysanthemum detailing on the footbed. Originally inspired by the Grunge fashion movement of the 1990s, the PLATFORM MID KIKU elevates your style wherever you go. The key features of this outstanding fashion piece include a smooth white suede upper, stacked outsole, hidden lacing and a removable velcro fastener that not only ensures a perfect fit, but also creates an extraordinary look. The PLATFORM MID KIKU is completed with all-over flower embroidery detailing. 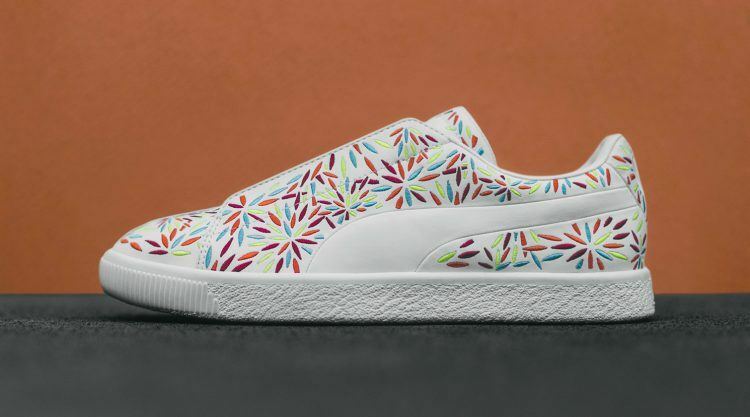 Appropriately, the PUMA KIKU PACK launched two days prior to the Japanese Kiku no Sekku festival (also known as Chrysanthemum Day) which is celebrated on September 9th. What’s next this winter, you ask? Well, it is, quite literally, the PUMA TSUGI KORI! 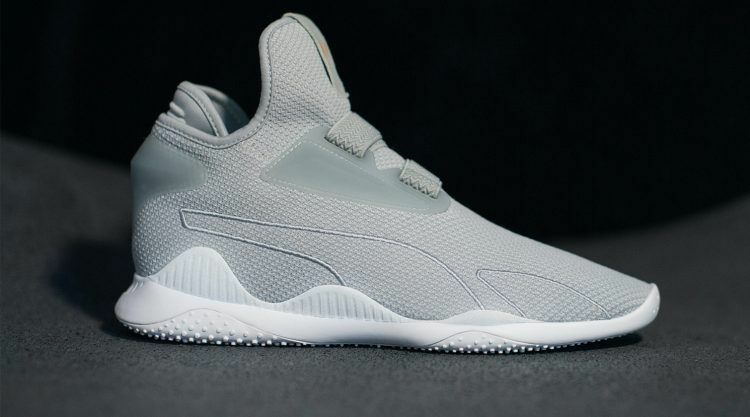 ‘Tsugi’ is the Japanese word for ‘next’, and the aptly named TSUGI KORI represents PUMA’s new Running Sportstyle era, combining the functionalities of a running shoe and the ever-elegant appearance of Japanese design. The TSUGI KORI draws inspiration from the iconic Blaze of Glory running silhouette and includes the innovative running technology IGNITE FOAM to offer ideal flexibility in the forefoot as well as cushioning in the heel. Featuring a rugged outsole for rougher elements, a ribbed knitted sock-collar for warmth, and a water-repellent body, the TSUGI KORI is the ideal sneaker to help stylize your fall and winter wardrobe. Our latest addition to the TSUGI line is available in three color options: Black and White, Black and Olive-Night, and Rock Ridge and Birch. Get ready to walk on the moon! PUMA celebrates ‘Tsukimi’, the traditional Japanese festival honoring the autumn moon, with the release of the PUMA TSUKIMI PACK. 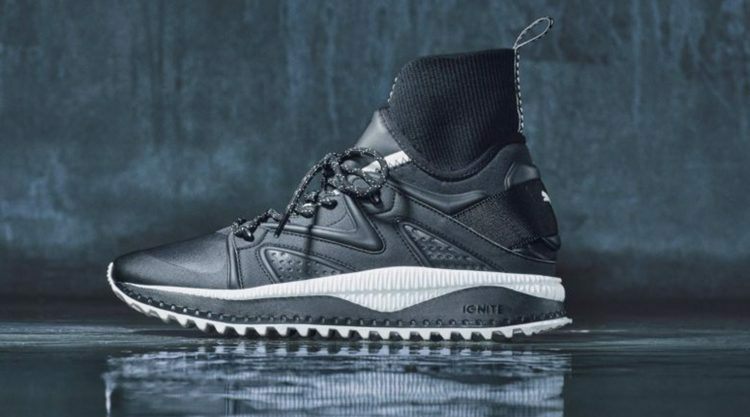 Featuring a clean, simple style, the three included sneakers – namely the TSUGI SHINSEI, TSUGI BLAZE, and MOSTRO – boast silhouettes to suit all fashion tastes. The Tsukimi influence in each design is brought to life by a tonal color palette with lunar grays and whites, subtle rabbit graphics alluding to the Tsukimi legend of the moon rabbit as well as reflective details on the midsole resembling a full-moon glow. The TSUGI SHINSEI pushes design to the next level with a unique side lacing pattern, a fully knitted sock for perfect fit and an all-new sole unit. The use of IGNITE Foam provides flexibility in the forefoot and cushioning in the heel part. The TSUGI BLAZE is based on the classic Blaze of Glory. Staying true to the iconic original, the style features a neoprene construction and molded overlays, but also comes with a woven heel gore as well as an EVA midsole and rubber outsole. Additionally, this stylish sneaker is equipped with IGNITE FOAM for perfect responsiveness and energy return. With the MOSTRO, one of our all-time bestsellers makes an appearance in the PUMA TSUKIMI PACK as well. While it retains the original silhouettes’ signature features, the new design fuses performance inspiration and on-point fashion for a premium, contemporary look and feel. 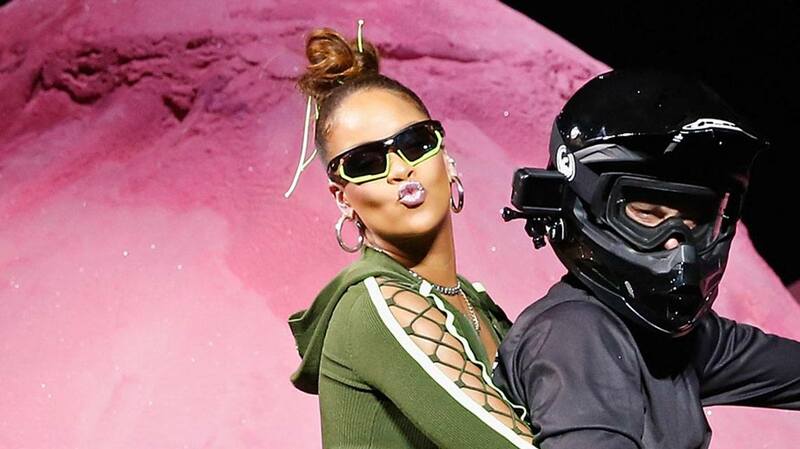 What will our products look like in 2030?